Do you have a career fair to plan? Even with a team of people, it seems like an overwhelming task. There are a lot of aspects to keep in mind for career fair hosting. It’s easy to let things unknowingly fall through the cracks. 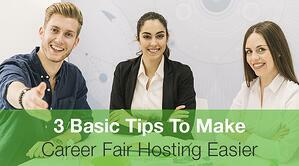 To make career fair hosting easier for you and your team, take a look at these three tips! Date: Take a look at the calendar and determine the best day to host your career fair. When career fair hosting for a college or university, it’s best to think about the timeline of a semester. The beginning of a semester is filled with students meeting new instructors, learning new subjects, and studying for their first tests. The end of semesters are stressful for students as they finish up important projects and study for final exams. For higher student attendance, it’s important to choose a date that falls within in the middle of the semester. More on picking the best date for career fair hosting. Location: Just like in real estate, location is key for hosting a career fair. Choosing a venue for a career fair is your next step after establishing a date. Large venues book quickly; so it’s vital that your team reserves the perfect venue for the date of the fair before it’s taken. When selecting the perfect venue, ensure there is enough space for recruiters between booths, plenty of room for students to walk, form lines, and ample parking for all those in attendance. Employers: In conjunction with your venue search, also put out word to recruiters and employers about the upcoming career fair. It’s necessary to start securing employers as soon as possible, especially if your career fair is during a busy time of year for businesses. Get the word out! To have a successful career fair, you need a high student attendance. Start advertising the fair as soon as you have all of the details. Start out with posts every now and then while the event is still far away, but as the day approaches, boost the number of messages to ensure students remember! Use all mediums available to your advantage, however, when advertising to a college demographic, you should focus most of your attention on social media advertising and email. Social media platforms are where college students receive most of their daily information and email is still the top choice for reaching those same students to tell them about campus related events. If you’re unsure of where to start to advertise when career fair hosting, check out the marketing materials provided by Career Fair Plus. These materials are designed to grab the attention of attendees and encourage attendance to your event. As you start finalizing elements of career fair hosting, keep everything organized. The large components are out of the way, and the small details can be inundating. Instead of becoming dizzy with details, make lists, ask for help, and talk through everything. One of the most common mistakes that happens in the final stages of career fair hosting, is a mistake in booth assignments. To avoid an employer being booth-less, or two recruiters being assigned to the same booth, make sure to pay extra close attention to these assignments if you’re doing them manually. Luckily, Career Fair Plus has created a feature to avoid this frequent blunder. Instead of assigning each recruiter to a booth yourself, use the auto-assign feature to ensure every recruiter has a place at your career fair. You can even upload a digital map of your space to help recruiters and students find particular booths in the venue! Career fair hosting doesn’t have to be scary! Be proactive, communicate with your audience, and keep a clear head to make sure planning goes smoothly!